Horizontal (time) and vertical (frequency) rulers, auto-adjustable to the duration and sample rate of the audio file and to the window size. Open the file passed as an argument. In the future Spek will also associate itself with common audio formats so that you could use it as a viewer. Fix a crash when the window width is very small. Spek 0.3 source code tarball and the Windows installer can be downloaded here. Spek now has a fully functional Windows port! The installer bundles GTK+, GStreamer and all their dependencies, you don't need to install anything else. I also moved project hosting over to Google Code so Spek now has a full-fledged bug tracker. The source code is still hosted on Gitorious. If you are tired of starting up monstrous applications like Adobe Audition or Audacity just to check a file's spectrogram, give Spek a shot! 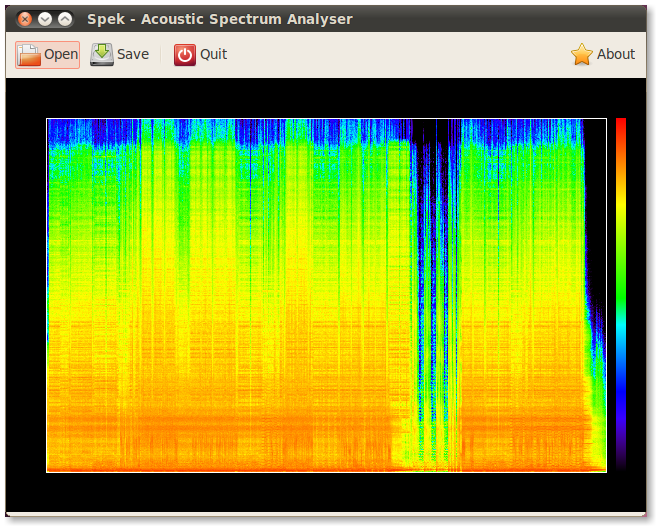 I just released version 0.1 of Spek -- a little program that shows spectrograms of audio files. Spek is written in Vala and uses the standard GNOME stack: GLib, GTK+, Cairo and GStreamer. 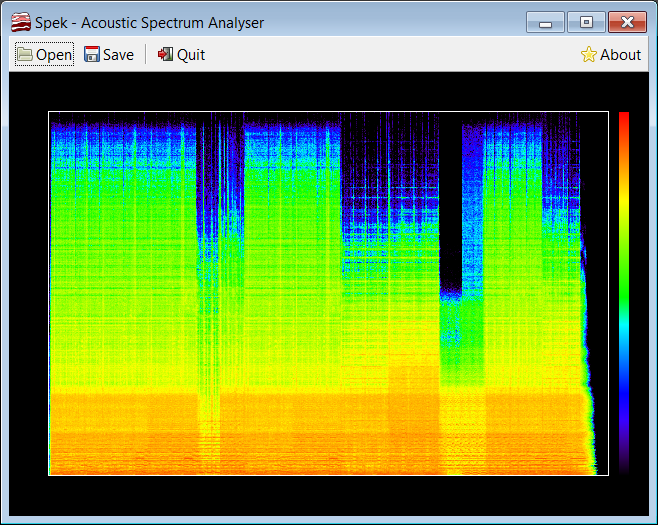 Spectrograms are used to analyse the quality of audio files, you can easily detect lossy re-encodes, web-rips and other badness by just looking at the spectrogram. Horizontal (time) and vertical (frequency) rulers. Zooming, scrolling and other adjustments. Associate Spek with audio files to use it as a viewer. Use multiple threads to speed-up processing. Or sudo make install to have it installed. I initially wanted to write Spek in Haskell to practice the language after reading The Haskell School of Expression (generously sent to me by Jorge). However, after writing a bit of code I realised that all the functional goodness of Haskell is not used at all because Spek is simply a bit of glue between GTK+ and GStreamer, with very little code of its own. Also, the prototype's executable size of 14+ MiB didn't help much in convincing myself that Haskell was a good pick for this project. I was left with C and C#. The latter didn't feel like a good idea for the same reasons: I wanted something lightweight for this small little app, C# would require a lot of dependencies. Also, while I really like C# as a language and Mono/.NET as a platform, I wanted to try something new for a change -- I already use them full-time on my day job and when hacking Banshee. The impression so far is hugely positive. Vala still has a few rough edges but nothing too bad and not work-aroundable. If you are tired of using C for your GTK+ applications, definitely give it a try! xmonad is an elegantly minimalist and lightning fast window manager for X written in Haskell. I wanted to play with it for a long time: I'm using two 24" monitors and so have to spend a fair bit of time re-sizing windows and moving them around. A tiling window manager like xmonad takes care of this; in addition you can control all aspects of window placement with the keyboard alone. The good news is: xmonad plays really well with GNOME. You can keep your GNOME panels, themes, desktop backgrounds, etc – xmonad just replaces Metacity leaving everything else intact. The bad news is: I should have tried it earlier. Recommended way to set up xmonad with GNOME is to export WINDOW_MANAGER=xmonad before starting gnome-session, but it didn't work for me. I tried every suggested place: ~/.gnomerc, ~/.xsession, ~/.profile, ~/.xinitrc; but none of them worked – GNOME always started with Metacity. That's right, the config file is a Haskell program that starts xmonad, which means it's extremely customisable. When touch-typing, some shortcuts are painful to use, Win-Shift-6 probably being the worst. What I wanted is to replace the Mod part with another shortcut, a bit in the Emacs fashion, so that instead of Win-Shift-6 I would have for example a sequence of Ctrl-m and Shift-6. To re-load xmonad after you changed the config file just press Mod-q. It takes just a second to re-compile and leaves all open windows intact. After using xmonad for 2 days I must say I'm a convert. The keyboard short-cuts feel very natural, it's not difficult to see the influence of vi. Moving a window to another screen or to another workspace (did I mention workspaces are per screen, which is a really neat feature), switching between workspaces, switching windows, changing layouts, etc... is just a short-cut away. And as a bonus point, I now have a good reason to become more familiar with Haskell – it's a very nice language. Played tracks are not removed from the queue but are shown as greyed out. You can play them again if you want, drag and drop to the back of the queue, delete, etc. The number of played tracks to show can be changed from the preferences dialogue. You can also ask Banshee to automatically update the queue using any shuffle mode (including the new by rating and by score modes). The number of upcoming tracks can also be changed in the preferences. 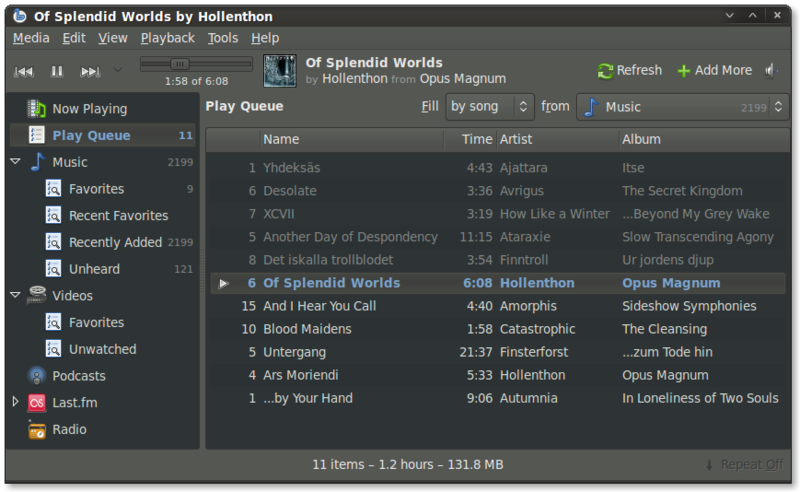 The tracks are taken from the entire library or from any play list. Tracks added manually are treated differently from those that had been added automatically. 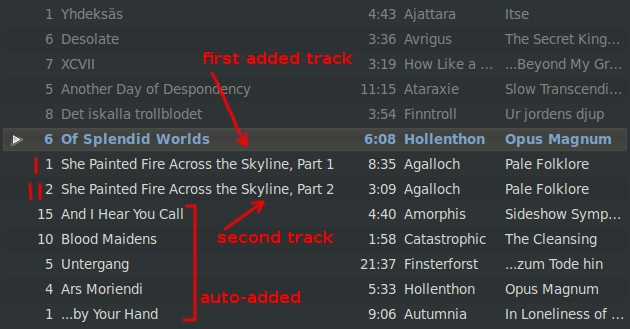 When adding, they are inserted to the front of the queue but after other manually-added tracks. Also, they are preserved when you refresh the queue. That's about it. If you like what you saw you can try the git master version. Otherwise just wait until 1.6 is out, it shouldn't take too long. Next version of Banshee will introduce two new shuffle modes: by rating and by score. In this post I will explain how they work since the modes can be a bit confusing. To chose the next track, we can pretend that our library contains 1,200 songs and pick one at random. If the track number is ≤ 100 × 3, we randomly select one of the 100 favourite songs, otherwise we take one of the 900 remaining songs. For ratings, we have 5 partitions – one for each rating. We could also put all unrated songs into the 3-rd partition (to treat them as songs with 3 stars) so that our entire library is partitioned. Now a good question is what to use for β? If we take β=1, all songs will have an equal probability to be selected. 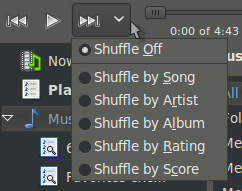 Note that it's exactly the same as the shuffle by song mode. If we take β=2, songs rated 5 will be played twice as often as songs rated 4, and so on. In terms of ratings, it means that songs with 5 stars will be played as often as songs with 4 and 3 stars combined, and so on. In the shuffle by score mode, the songs are partitioned into 20 slots, first slot for the songs scoring 1…5, second – for 6…10, and the last – for scores 96…100. We also put songs with no score into the 10th slot (46…50).